Plogging is needed to make the best of the fading light at 6pm on a cool sunny March evening. Twenty four children aged six to ten from Woodcraft Folk Elfins aged 6 to ten year olds – did exactly that: Picking Litter and jogging their way to Highbury Park to play football, climb trees and watch bats. Judging by the cigarette buts, gas canisters and junk food litter, it seems unlikely to be these children dumping their rubbish, but the children all sigh, as if it isn’t the first time they’ve felt blamed for the litter. The group take turns to use the pickers and bags to make sure everyone gets a turn – It’s only fifteen minutes to the Park, but by the end of it every tiniest piece of litter on the pavement, stuck in a hedge, or even on someone’s driveway has been picked up. 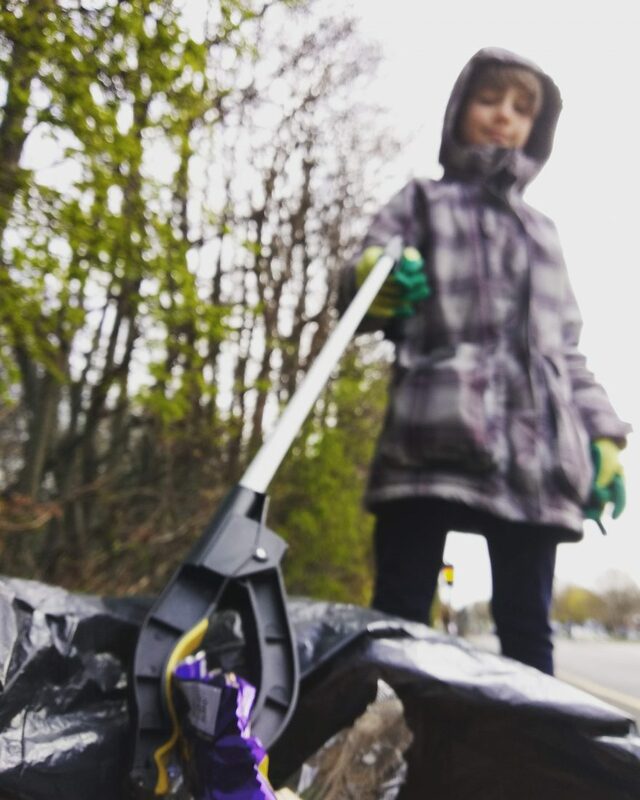 Children may or may not be litter bugs, but this group are certainly doing their bit to clean up, and this isn’t the first time the group is litter picking. Three days later I join Swan Corner Community Group for a Sunday Litter pick. Swan Corner Community Group started after Active Streets brought local residents, The Billesley Pub and Swanshurst School together to begin tackling local issues like dangerous parking and litter. Once again children were as much involved in the litter picking as the adults, and probably least likely to have dropped the litter. And it’s true that everyone who passes the litter pickers makes comment, ‘Good on you mate’, ‘that’s great’ or other words of encouragement. Keep Britain Tidy have again organised their Great British Spring Clean for a whole month from 22nd March to 23rd April and Birmingham are again supporting the event. Litter picking itself can be quite satisfying, but the conversations with neighbours and a clean neighbourhood at the end makes it all worthwhile. Click here to find and join a litter pick, or log your event with Keep Britain Tidy. If you’re starting your own one, please make sure you confirm the date, time and location of your event – do not click the private option, otherwise your details will not be sent over to Birmingham Council. The Birmingham Team will then contact you to find out what equipment you will need, for example rubbish sacks, litter pickers, high viz vests etc. Please also confirm the location that the rubbish will be collected from. This year it is all about improving the environment as well, so if there are any bigger jobs that may need a tractor or other equipment then ask the team and they will let you know if they can help out! There is however a limit in extra equipment, so contact them ASAP! Please take photos of your activity – send to us or contact us if you want to share your story – #GBSpringClean for social media. We run plogging as part of our regular Run events, and as part of other events we are run like at Meriden Park Saturday afternoon 13th April and Bosworth Wood Playing Fields 1 to 3pm Wednesday 17th April. Or you could just set off down your street and start litter picking!